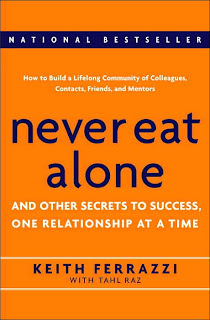 Never Eat Alone, by Keith Ferrazzi, is a book about connecting with people. Ferrazzi himself is a master connector. A connector, as Malcolm Gladwell describes it in The Tipping Point, is someone who links the world together. Someone who has a knack for making friends and acquaintances. In real life, their social network is at least 100 people. On Facebook, it's probably closer to a minimum of 1,200 friends. I'm sure we can all think of one or two people like this (that's the nature of it... they're already you're friend). By the way, I just looked up his profile on Facebook and he has an extremely active Fan Page with about 8,900 fans. In the book, Ferrazzi talks about the skills and habits he's acquired that has helped him connect with people. He starts off talking about how to create a mindset of a connector - to always be on the lookout to help someone. He emphasizes how critical it is to memorize people's names and something special about them. And how doing that can lead you to meeting people you never thought possible (by, for example, getting to know the gatekeeper of some super-busy executive). When meeting with someone, Ferrazzi likes to share his passions with them and learn about their passions. Then, take it a step further and try to figure out a way to help them with their passion. Can you do something yourself? Do you know someone who might be able to help? One of his favorite things to do during a meeting is say, "I know someone you absolutely must meet." Right then he opens his phone and dials the person and says, "I'm sitting with [name] and you have to meet him. He's interested in [his passion]. Would you be willing to meet with [name]?" Then, during the critical follow-up, he makes sure the two of them were able to get together. Ferrazzi also goes into detail about what he does at conferences and how he handles small talk. The big take-away I got was this: be an active person and invite people to join you. It's these activities, and shared experiences, that create the raw material to form a relationship. Oh yeah, and always follow-up. Ferrazzi finishes up the book talking about larger issues. He talks about creating your own personal brand, finding people in your life to ground yourself, and pinging people constantly. It is packed with advice. In some ways it's like a textbook that can't be read casually because there's too much to take in. Actually, that would be my one criticism of the book: Since connecting comes so easily to Ferrazzi, he tends to touch on one piece of advice and then jump to the next instead of staying on a few topics and really diving down into the details of each one. My next steps are going to be to go back and focus on a couple areas I'd like to improve upon and learn how to do those better. Overall, I thought it was a good book and worth my time. I'm glad I read The Fine Art Of Small Talk first because it gave me a solid rolling start into this book, and would recommend others read them in the same order too.